We have no doubt that everyone interested in PC Gaming or gaming in general has heard of Alienware, the gaming specific division of Dell. 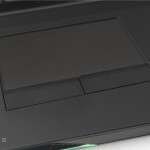 Alienware for years have always not only brought the top hardware available, but do so in a stylish and unique housing. The latest and greatest from Dell is no different and the Alienware 17 offers the some of the best possible spces around along with RGB LEDs everywhere that the user has complete control over. 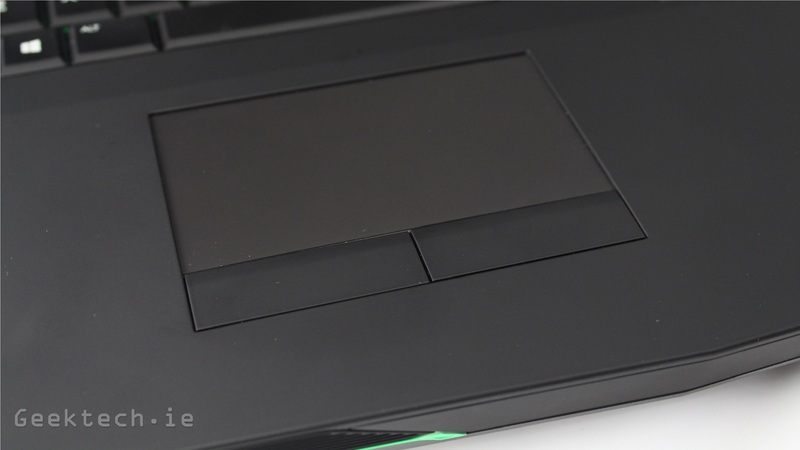 The most important factor of any gaming laptop is the specs, so let’s take a look at the specs we have for the Alienware 17, and remember that when buying an Alienware, you can customize each component yourself. 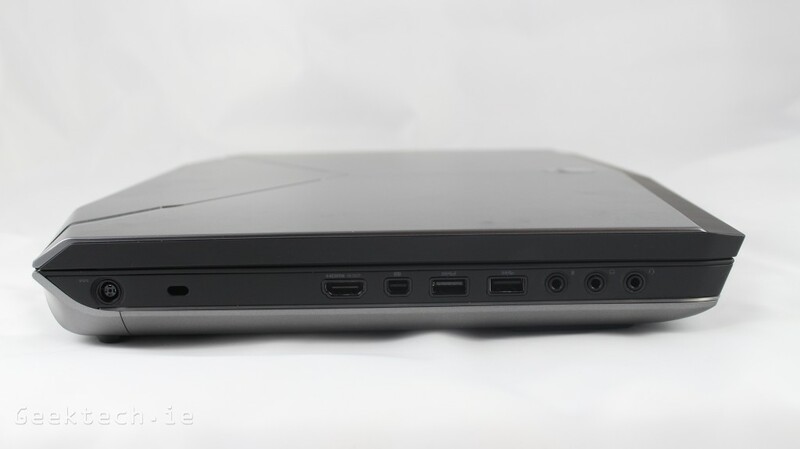 At this time you may need to wipe some drool off your face as you have just read the specs and we agree, we are easily expecting some amazing results and performance from the Alienware 17. 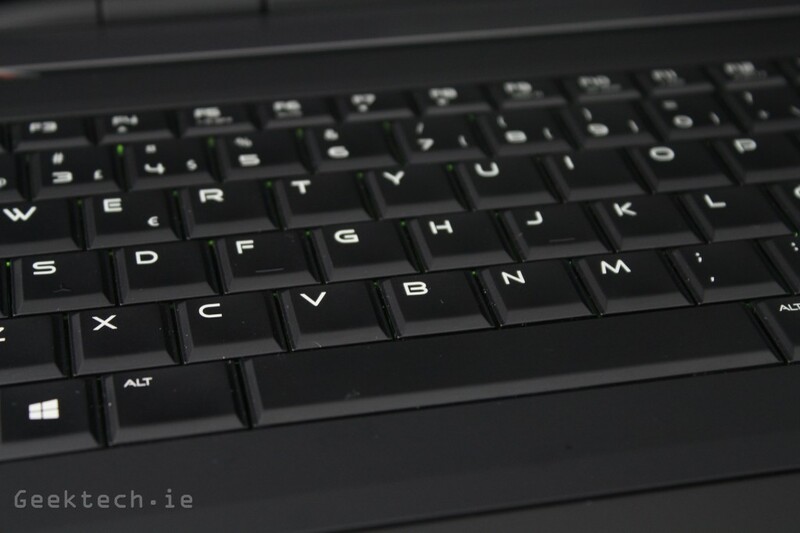 At the time of reviewing this laptop, the price for this specfic setup is € 2,099.48. We have include the gallery above, but let’s break it down some more and take a look at the design and connections it has. Starting we the left side, we have the power connector, Kensington lock, HDMI IN/OUT, Thunderbolt, 2 x USB 3.0 and finally 3 x 3.5mm headphone, Microphone and headset connections. 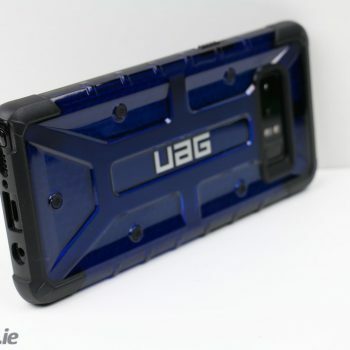 The right side contains the BD/DVD reader/writer with memory card reader above it, 2 x USB 3.0 and the gigabit Ethernet connection. 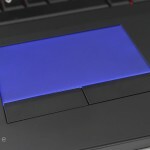 The track pad also contains an array of RGB LED’s allowing you to select any colour you wish, as does everything on the laptop. You just can’t have a gaming laptop without a backlit keyboard and like we said above it’s RGB backlit, which means any colour you want, even more you it’s broken down into 4 sections and you can have different colours on each. We did enjoy having the entire laptop cycle through different colours on its own. 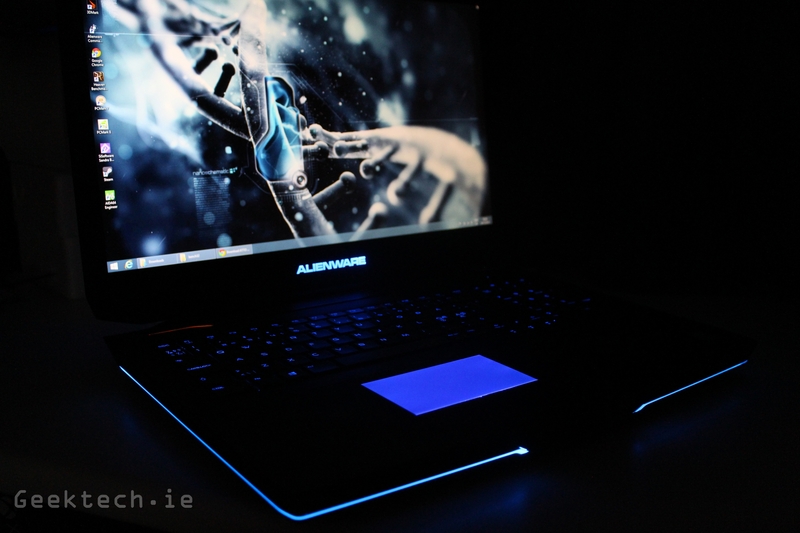 It wouldn’t be an Alienware if it didn’t have LEDs all of it and yeah, we must say that they look fantastic. 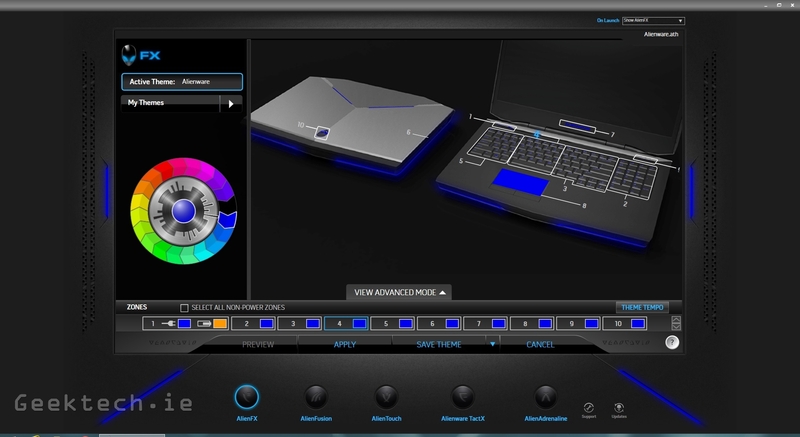 You have complete control all of the LEDs using the included Alienware command software. We set ours up to cycle through red and green and we must say it look pretty fantastic and we could even control the tempo. 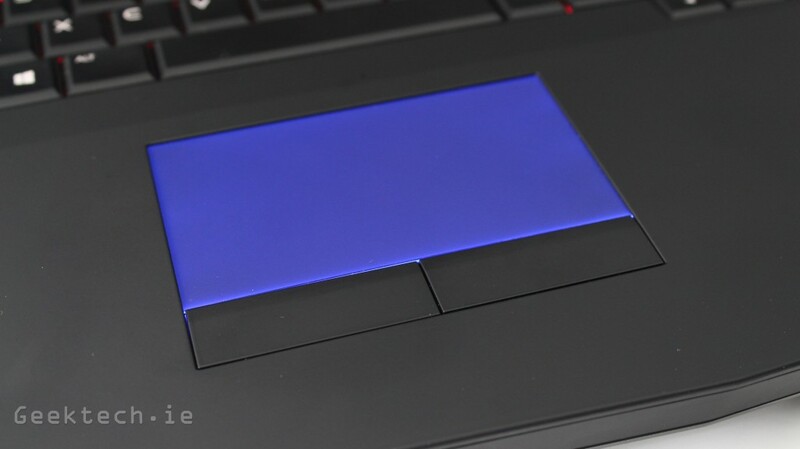 You can even have the LED’s flash for a notification for emails as well, which just put’s the Alienware 17 on a level of its own when it comes to customization. Now it’s time to gauge the performance the Alienware 17 offers and we have done a good few different benchmarks that should do that nicely. Some test include comparisons against both the Toshiba 870X from last years generation of hardware and the more recent 70X that includes this years hardware which include the 4700MQ and GTX 770M. 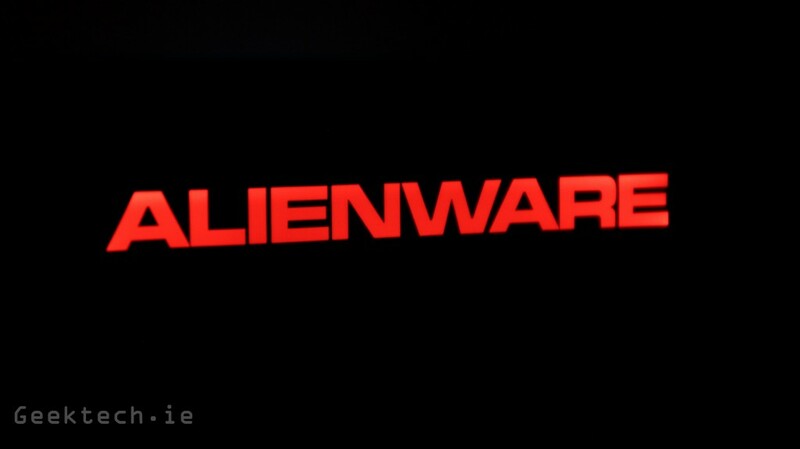 The Alienware 17 includes a 4800MQ and GTX 780M. 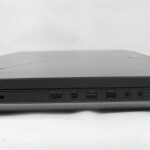 The Alienware 17 just about pushes ahead compared to the Toshiba x70 and is of course miles ahead of the last generation x870. 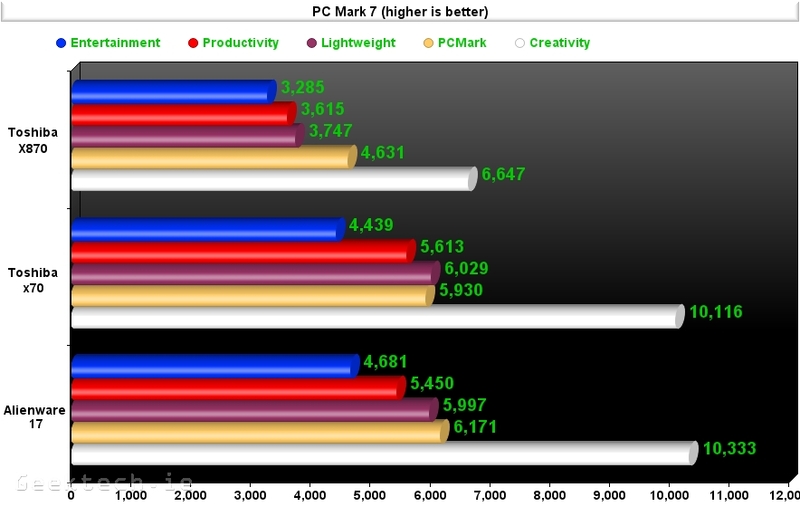 The x70 does push ahead in the Productivity and Lightweight tests, but again these results are so close, overall they are nearly identical. The extra 300mhz on the CPU the Alienware 17 has over the Toshiba x70 is no doubt at play, but only gives a slight edge performance wise. Here we are seeing a much bigger leap in performance that no doubts comes directly from the GTX 780M over the GTX 770M from these two gaming laptops. 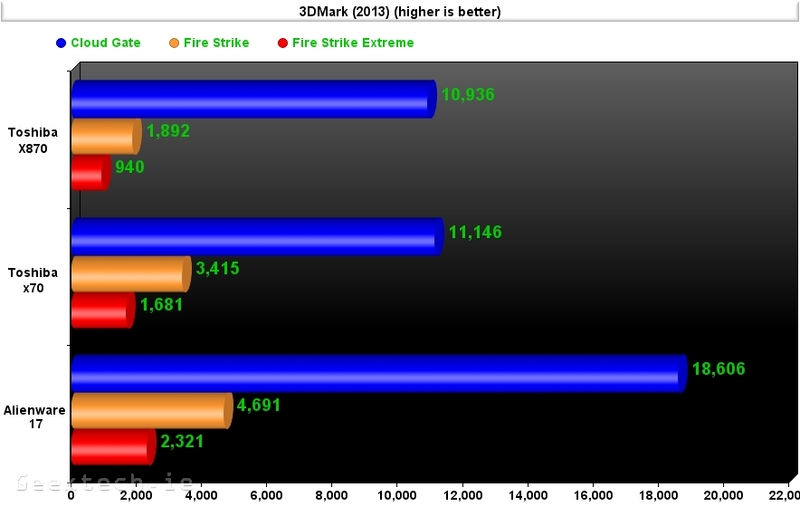 The same happens again with 3D Mark 11 results and the Alienware 17 is taking a pretty impressive lead. The choice between GTX 770M and GTX 780M is becoming more and more clear. A interesting thing to note here is that the Toshiba x70 doesn’t have the option to shut off the Nvidia Optimus technology. 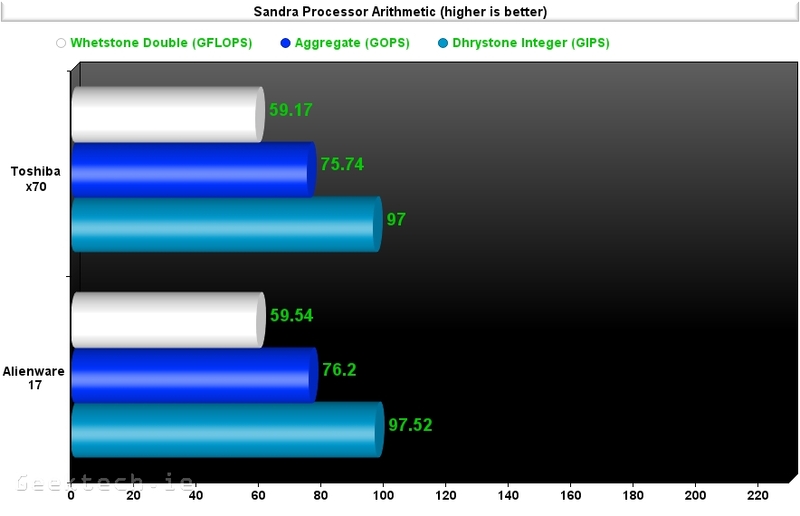 So basically the massive gap between Cloud Gate benchmarks is because the Toshiba was actually using the Integrated graphics inside the Intel 4700MQ for some of the test, if not all of it, but since the Alienware 17 has the option to shut off the Optimus tech, we can just use the dedicated graphics card and in this case the GTX 480M smokes the Toshiba x70 results. Both the Fire Strike and Fire Strike Extreme tests would be using the dedicated cards and again the GTX 780M of course takes a significant lead in performance numbers against its weaker sibling the GTX 770m. 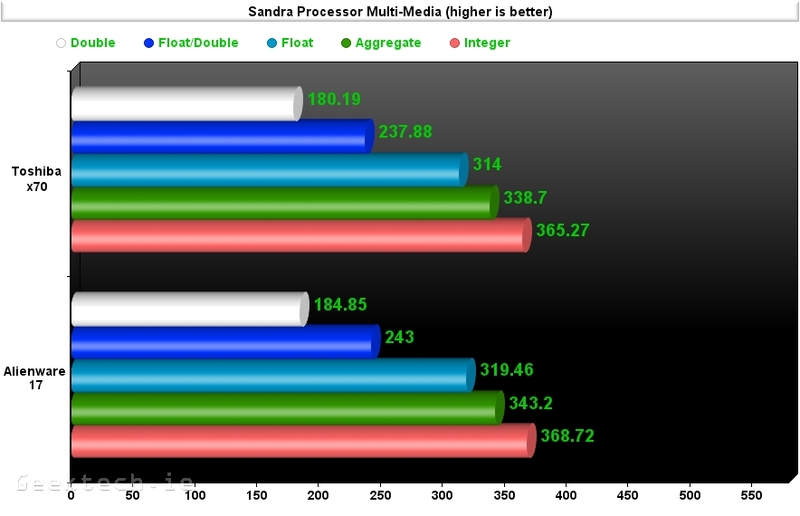 At this point will just let the benchmarks do the talking. 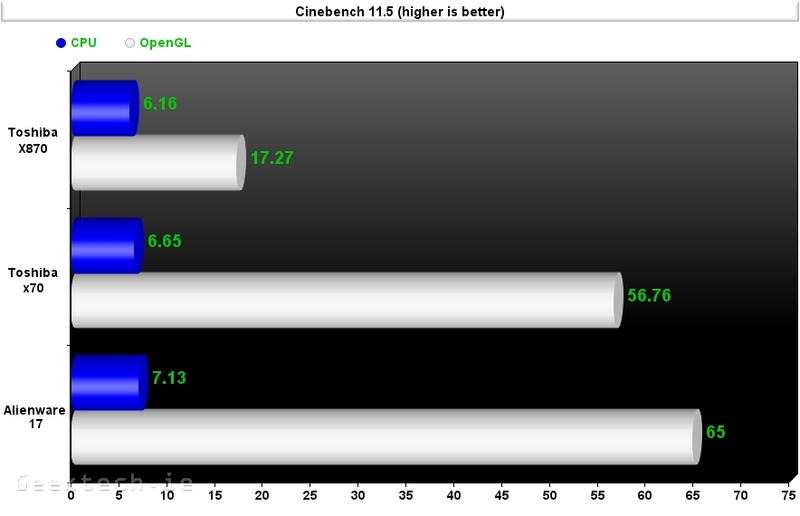 Cinebench is a great way to gauge performance of your desktop/laptop or even tablet in some cases. 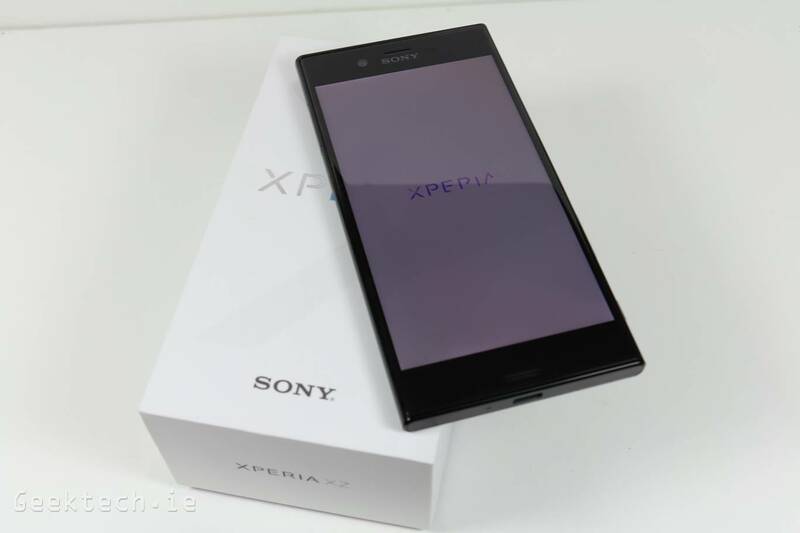 It’s a quick test and you get a great idea of what performance you can expect. 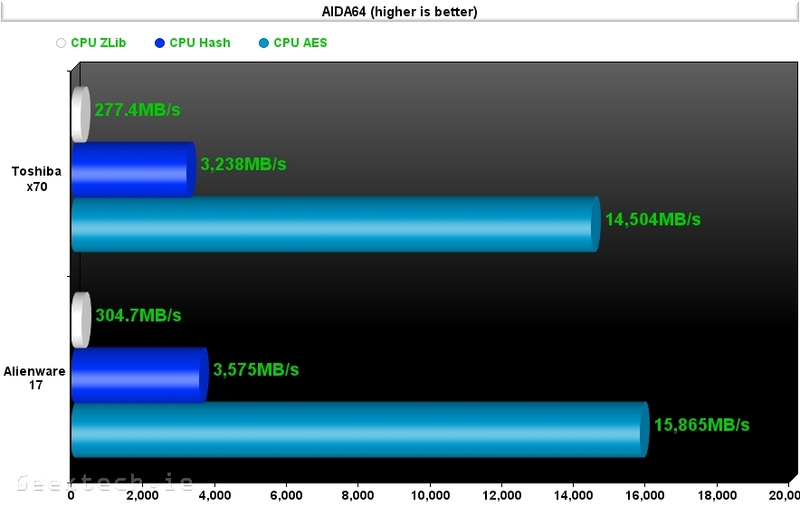 The numbers may seem small but even that 0.48 lead on the CPU makes a difference, so yeap, that small but 300Mhz is significant in the end. OpenGL again shows a massive lead and we know it doesn’t look it in the charts, but just take a look at the previous generation and consider the lead there. 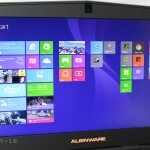 The Alienware 17 has an impressive lead yet again with just 10 points compared to the Toshiba x70. 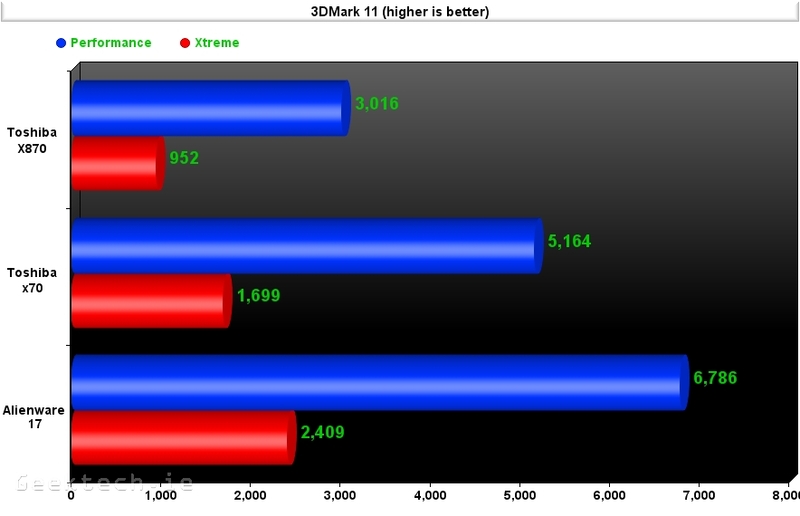 Another graphical based benchmark that includes multiple options and settings. We performed two tests on both gaming laptops with the first test we just changed the settings to hight and left everything else on default or off, so no anti-aliasing or Tessellation. The second test however kicks the settings up to Ultra with 8xAA and Tessellation set to Extreme. Both tests show the GTX 780M inside the Alienware getting an impressive lead aginst the GTX 770M inside the Toshiba Qosmio x70. 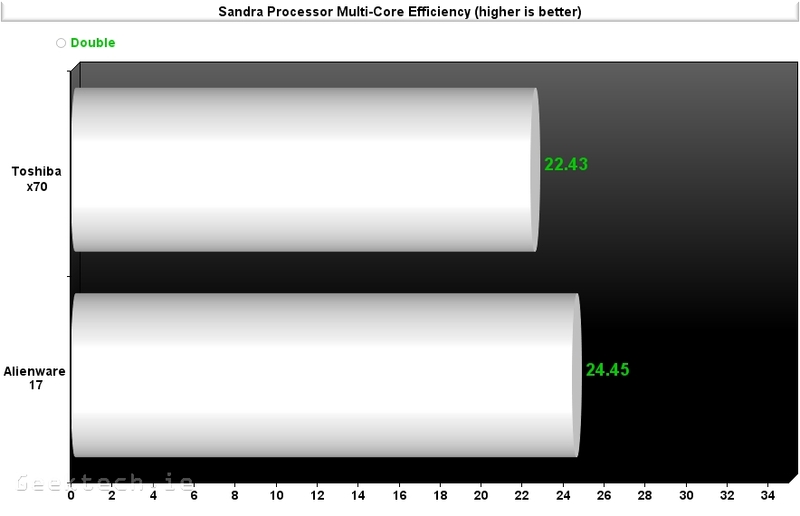 Every Sisoft Sandra test shows the same thing with the Alienware 17 gaining only a slight margin of performance above the Toshiba x70. 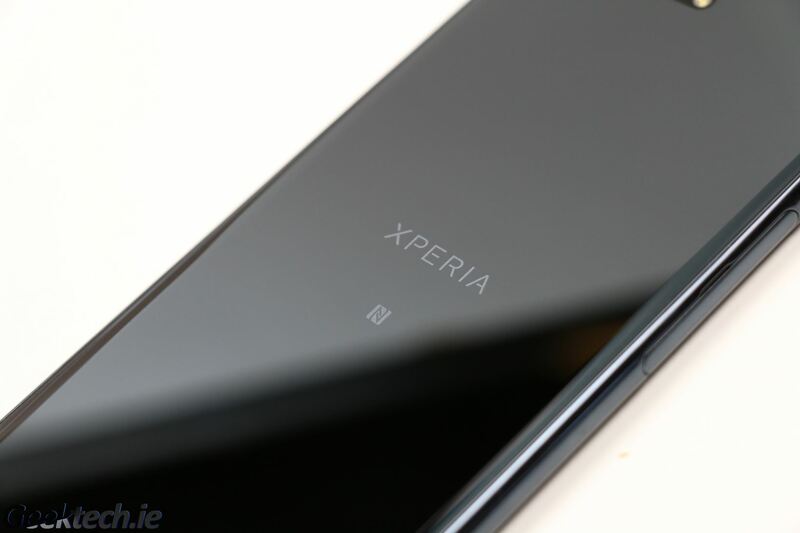 A quick intro to the battery benchmark. 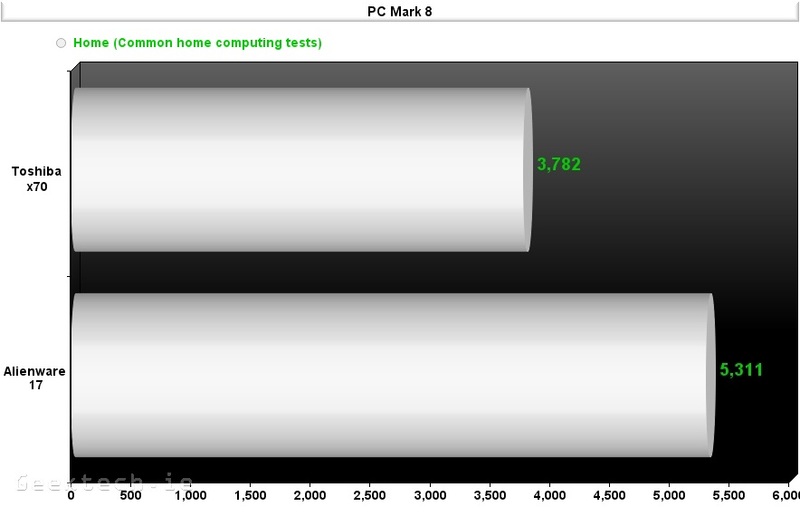 PCMark 8 battery tests simply loops a specific benchmark until the battery reaches just over 81%. 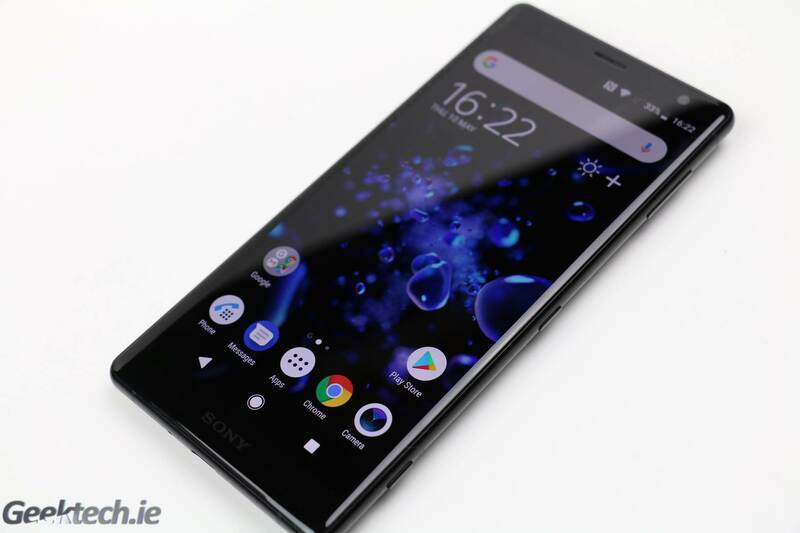 The benchmark used was Home (Conventional), this benchmark includes web browsing, video playback/encoding, writing, photo editing and casual playback. It should easily give you an idea of how long the battery would last if your doing typical computer like tasks. 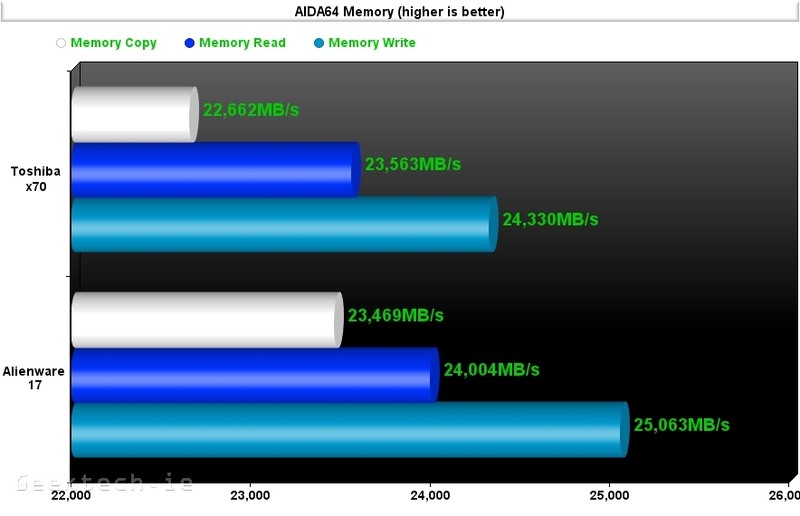 We have included two tests, with one have the Nvidia Optimus technology on and the other having it off. The Optimus technology allows you to utilize the Intel integrated graphics for low performing tasks and not just the dedicated graphics(GTX 780M). 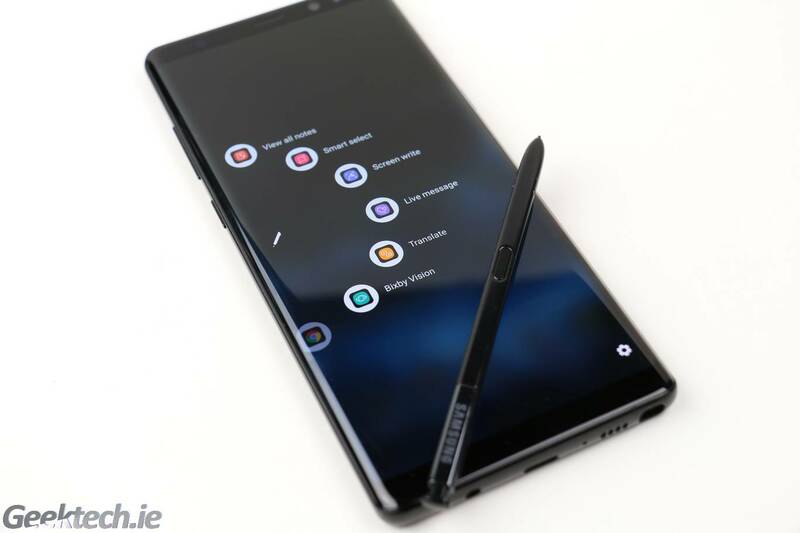 This gives somewhat increase power efficiency, but keep in mind that if the Optimus technology decides tasks needs more performance, the dedicated graphics card will kick in, and that of course uses more power. Dell have included an option to disable the Optimus technology and just use the dedicated graphics. 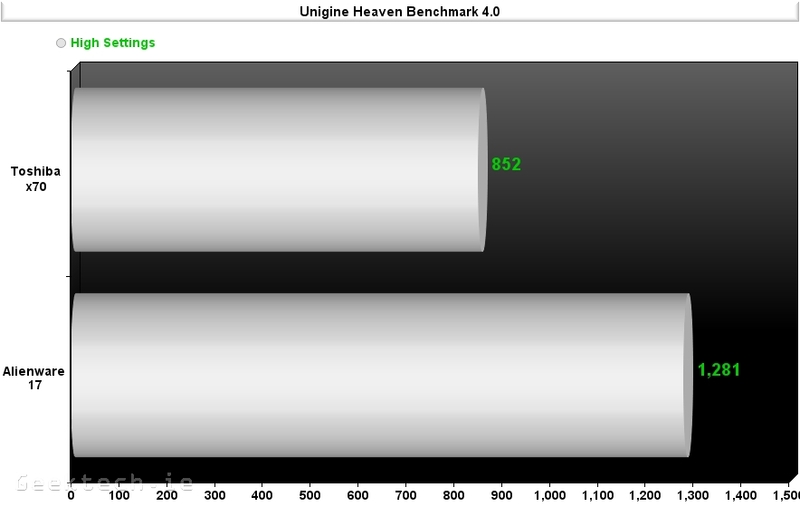 So we have included both battery benchmarks to show you how much power is saved when using Optimus. 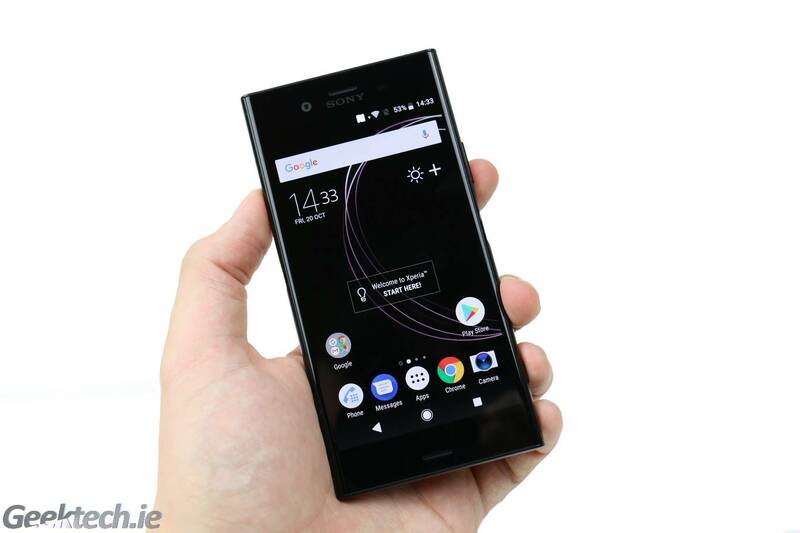 The Optimus technology from Nvidia added around 23 minutes of overall battery life, but performance was of course decreased somewhat when comparing both results. As anyone would expect the only real change is with the casual gaming. Now it’s time to take a look at some direct gameplay performance. As always we set up a camera to record gameplay as to not use software options as they could potentially hinder the results recording gameplay. 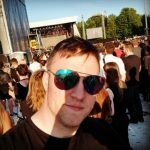 We display the settings used for each game at the beginning, however just over a 1min and 30 secs for Crysis 3, but overall you get a great idea of just how well the Alienware 17 performs. 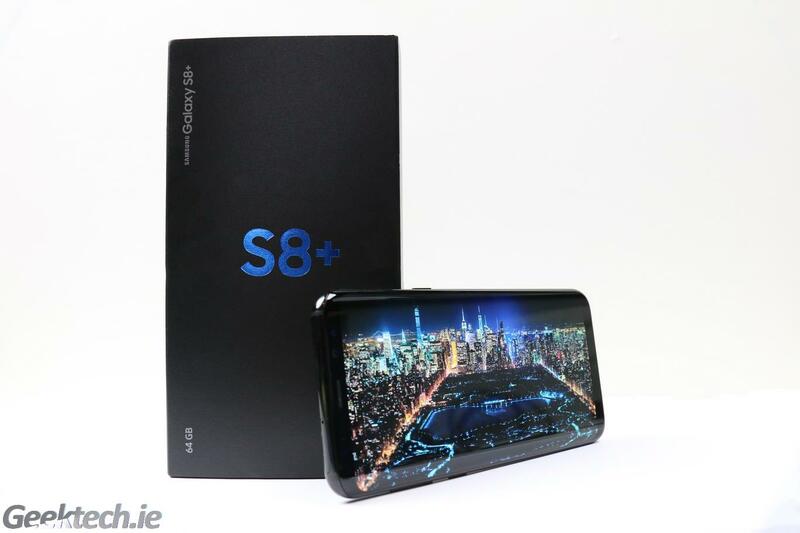 We have reached the conclusion part of the review, where we take all of the benchmarks, comparisons and details and pretty much sum up the entire device. 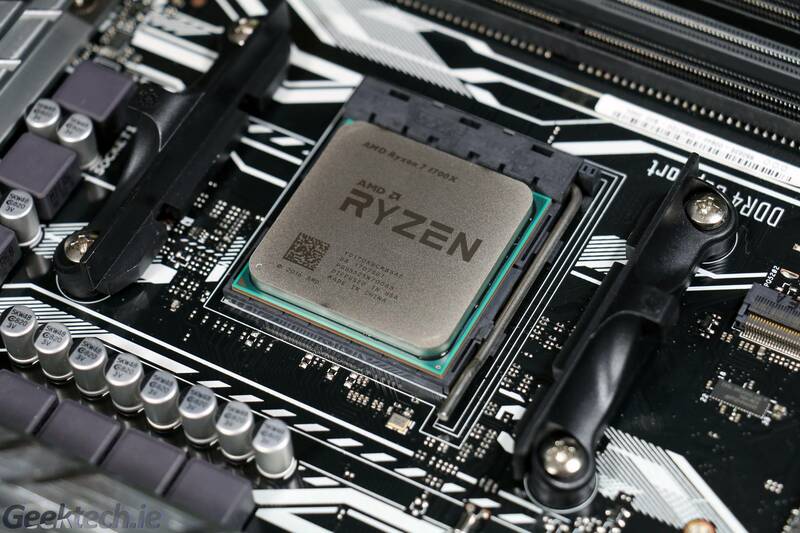 Being a gaming laptop, the performance is extremely important with every aspect as gaming requires it, but not only that, gaming laptops come with extremely high price tags, so one would expect greatness across the board. 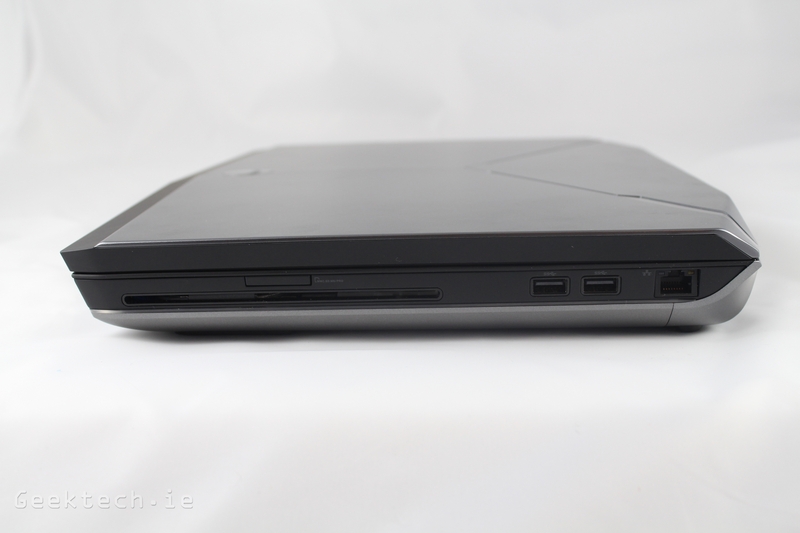 So now it’s time to sum up everything about the Dell Alienware 17 for all its worth. Forcing ourselves to find a negative, it would have to be the weight of it, but if it was light, then we would have assumed some powerful magic was involved. This is truly the best gaming laptop money could buy and that’s taking everything into account. 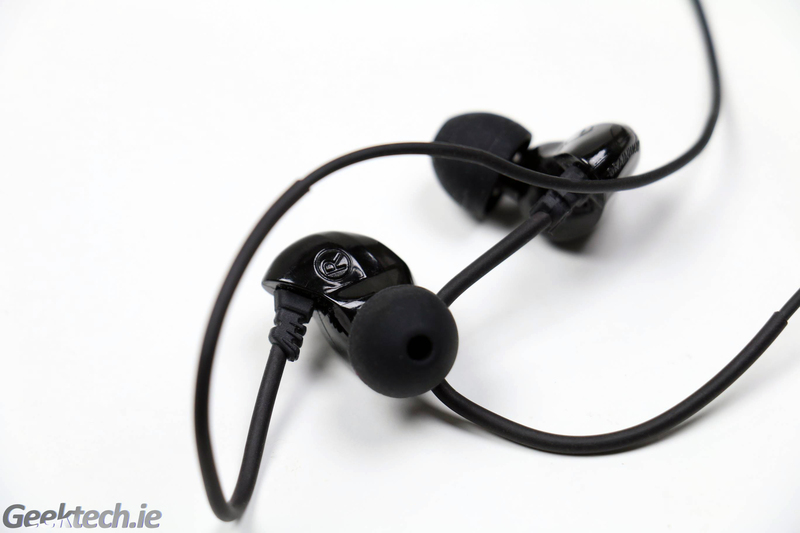 While the price is high coming in at €2,100, we feel the top tier components and excellent design and features warrant it compared to all the competition out there. We will say it again, performance is key with any gaming laptop , so it’s worth noting that the Alienware 17 has it pouring out of it. 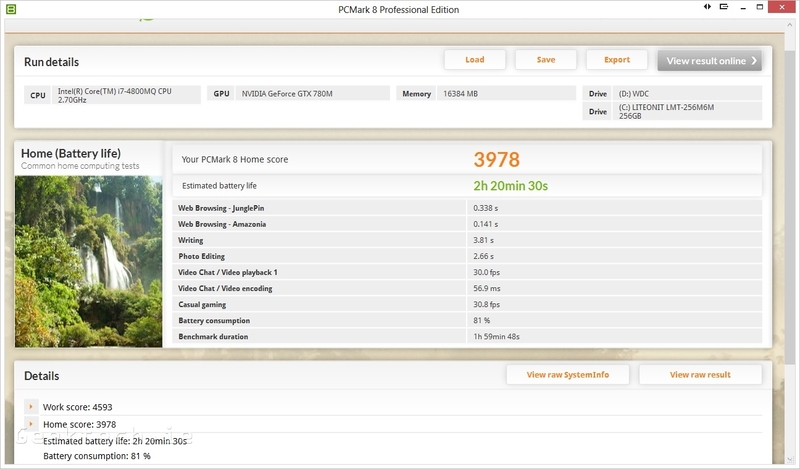 Every benchmark shows amazing results thanks to the latest and greatest Intel I7-4800MQ CPU and GTX 780M GPU. 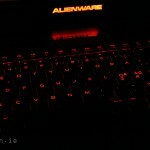 The Alienware continues its greatness with a unique and beautiful deign that even at first look, anyone will know straight away this is a powerful laptop. 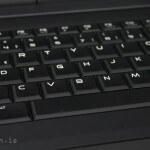 Like always LED’s have a special place with gaming laptops and Dell put them everywhere and gave the user complete control over colour, tempo and more. 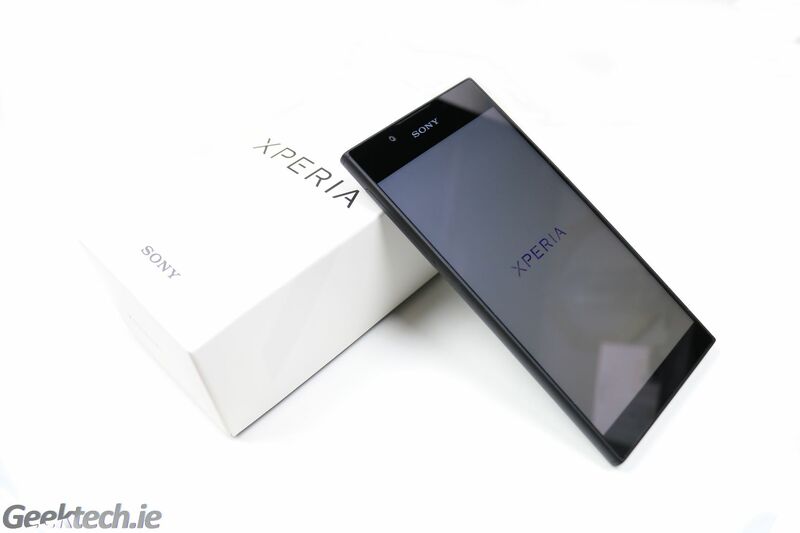 We absolutely love the design and think it fits the high performing machine perfectly. We could list the pros and cons of the Alienware 17, but everything it packs inside is just another tick on the pro list. There really isn’t much to fault it besides weight and battery life which are at this point traits of the gaming laptop business in most cases. Battery longevity isn’t nearly as long as we would like, but considering the performance it offers, we are pleased to get even that long, after all it’s a gaming laptop and like we said above, they generally don’t provide a long battery life. 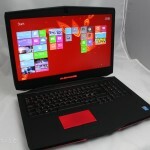 We feel saying gaming laptop is the best to describe the Alienware 17, but better yet it’s THE GAMING LAPTOP. Ah go on, here’s the pros and cons list. 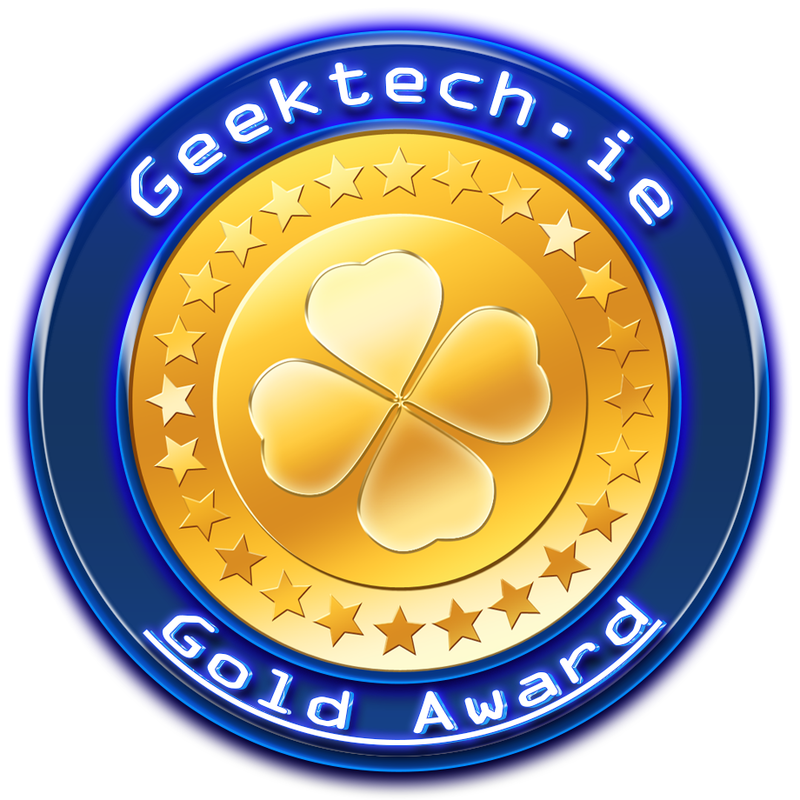 It of course get’s big shiny Gold award and it would have been higher had we had a higher award to give it as we just love everything about the Alienware 17. 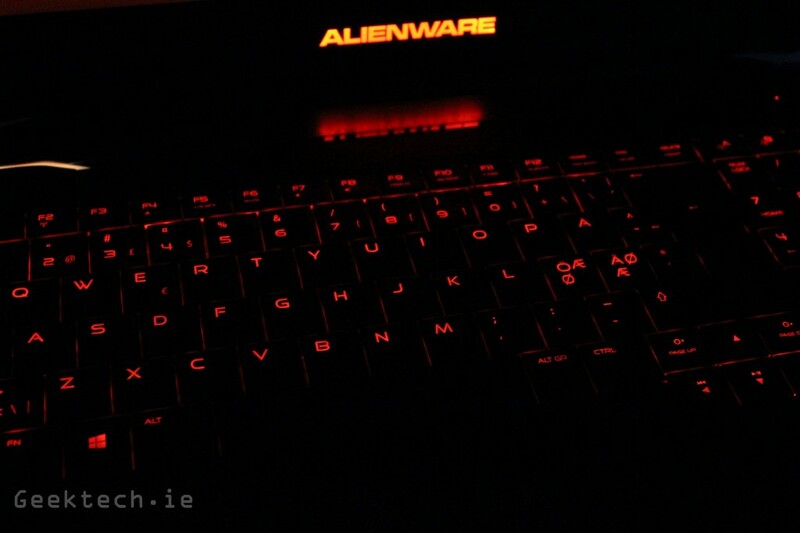 To make it simple, if your lucky enough to be able to afford a nice new gaming laptop or are willing to sell a kidney to get one, you will not regret the Alienware 17, in fact, we think anyone would love it. 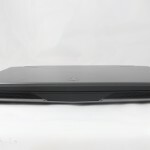 A big thanks to Dell for sending the Alienware 17 out for review.